The guitarist and singer, whose real name was Fatai Olagunju, had fallen into obscurity after highlife's popularity faded decades ago, only to have his career revitalised recently by tradition-minded musicians. He once said he had 15 children, with the youngest born only a few years ago -- the result of an "adventure" on the sidelines of a concert in Germany, according to him. "I can confirm to you that he passed on this morning," Ipaye Olajide, spokesman for the ministry of culture in Nigeria's economic capital Lagos, where Fatai lived, told AFP. "A lot of artists are in his house now to express their condolences," she said. In highlife's golden era, Fatai was a nationally celebrated performer. Highlife music, born in Ghana in the early 1900s, reached its peak in the west African region in the 1950s and early 1960s. His popular song "Won Kere Si Number Wa" (They Cannot Match Us) asserted his generation's superiority over those younger than him. A Yoruba from southwestern Nigeria, he once said he was given his nickname when he was a child because he often carried a few American dimes in his pocket that he and his friends would "roll" or flip. Fatai's colourful personality showed in his music and even in his dress. In an interview with AFP more than a year ago, the bearded musician wore a yellow-and-blue outfit with canary yellow sunglasses and a military beret. During the interview, he bemoaned the hip-hop music that now dominates in Nigeria, Africa's most populous nation. "If you want to know a good musician, a good musician should know how to play any instrument," he said, describing his irritation with artists he accused of sometimes being "lazy" and simply seeking "easy money." Nigeria's Jazzhole Records later released new music from him, including the album "Fatai Rolling Dollar Returns." 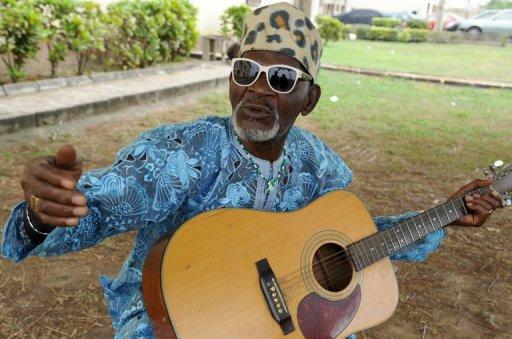 Highlife musician Fatai Rolling Dollar poses with his guitar in Lagos on August 25, 2011. Fatai, whose West African highlife music, sexual boasts and infectious guitar playing made him a beloved figure in his country, died Wednesday at 86, a government official said.